My Phone Support is staffed with expert technicians who have excellent technical qualifications and an extensive knowledge of Windows systems and a minimum of two levels of certification. The team also includes highly trained specialists with Microsoft, CISCO, Oracle and Novell, as well as Apple certifications such as A+, MCP, CCNA, MCSE, CCNP, Net+, Red Hat, Linux and Mac OS expertise. My Phone Support also offers several solutions for fixing your tech issues. The company offer a one-time fix for $79.95 or a $249.95 per year unlimited option with no setup fee. Although there may be some instances where an extra fee could be assessed such as for an on-site visit, etc. My Phone Support has the expertise for just about any device you need tech support for: PCs, Macs, mobile devices, and the company doesn't a limit on the number of devices it can support on a single subscription. My Phone Support provides the benefit of multiple service options: diagnostics, virus and malware removal, software installation, and data security services-regardless of whether you are an individual or a business owner. The company also provides third-party services for software, phones, printers, gaming consoles, scanner, digital cameras, and more. 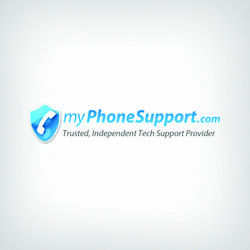 My Phone Support offers three service options: by phone, remotely by using a secure internet connection, and they also offer an on-site option as well. The company claims to be able to resolve 99% of all tech issues remotely. And services are available 24/7 worldwide, so no matter when you call, someone can assist you. Fortunately, My Phone Support does offer a money back guarantee; however, specific details regarding this policy-exclusions, etc.-are nowhere to be found on the company website. Having a money-back guarantee is important, especially for companies like My Phone Support that don't offer a free trial of any kind, or charge expensive yearly rates ($249.95). You wouldn't want to have paid that kind of money for a service you weren't happy with. Unlike many of its competitors, My Phone Support doesn't offer any type of customization services; however, they have two payment options that pretty much cover anything. If you only need a one-time fix, this company offers that. The company also caters to customer who have an ongoing services for issues that could arise throughout the year. Unfortunately, My Phone Support doesn't offer a data recovery option. This is something we would like to see added to the company's existing suite of services. Data recovery services are becoming increasingly important in the industry, both for individual customers who just want to preserve their family photos, as well as for businesses whose success depends on having their data securely in place. Most tech support companies offer either customized plans or at least a variety of plans from which their customers can choose; however, My Phone Support does not. With this company, you are limited to two options. A one-time fix or a yearly option. The yearly option requires you to pay the full $249.95 upfront, then after that first year you have the option of being billed $18.95 per month until you decide to cancel. My Phone Support has quite a few certifications and offers a wide variety of services. The money-back guarantee adds definite value, but customers will need to do some independent investigation to determine what exclusions (if any) apply. We would like to see My Phone Support add a data recovery option to its line of available services, as this is becoming a must-have service for top tech support companies. Additionally, we'd like to see more flexible service options from My Phone Support. That being said, we can recommend My Phone Support to anyone with basic tech support needs. They always fixed my computer good. The only thing is they leave pups but I get them deleted after thet get off control of my computer..i never had a problem with them.. In the past year I have been extremely satisfied with this site. However, today when I called for help I was told that all technicians were busy and my call would be returned as soon as one of them was available. It’s been four hours - and I tried calling again, but have received no service or call back. I am concerned . Is this company still viable? The technician for today was excellent. He resolved my problem quickly and was very efficient and professional. Nitesh did his best to assist me. When he had difficulty, he solicited the help of Rennil Rose A. and Arnel G. After a period of time, both of my issues were rectified. I was given the opportunity to restart the computer and certify that the problems were fixed. All technicians were courteous and professions. Nitesh was very professional and solved my problem completely. I enjoyed having him as my technician. You took care of my scam problem and cleaned all the viruses that were in my computer. You were very courteous and patience with me on the call. Thank You! Nitesh was did a excellent job in assisting me in getting my printer software loaded and the printer working. Thank you.. I am very please with the services that I received, they were very helpful . I found my support experience satisfactory. The Techs were very knowledgeable, courteous and willing to respond to my questions regarding the issues I encountered. Due to the short closer, I did not get specific cause of this issue. If I could have that info I would appreciate it for future incidents. Nitish was terrific and got me through this hacking experience. My computer is now fine. Aditya and Nitesh were unbelievably great!! The time spent on my computer to get the job done RIGHT the first time exceeded my expectations. I tip my hat to both of them. I am very impressed with their services! Gaurav R. was very patient with me and spent over two hours resolving the problem with my computer. The one year plan that he mentioned is well worth it! The technicians were all very polite. It took quite a while over 2 days to get all the problems fixed, but they got the job completed and the computer is working fine now. Nitesh was very patient with me and worked a long time to get the scammer out of my computer. i am very pleased with that. Experienced the usual (for me at least) difficulty understanding the individuals I talked to and for a little while I was really not comfortable that I was in fact speaking with an actual Microsoft company person. The repair in question was taken care of very well. I just finished a service call with Gaurav R. and I am very satisfied with not only the service he provided but also the kind patience he showed me. Nitesh was very polite and patient in solving my problem. He explained everything he did as he was working on my laptop. I am very pleased with his with his service. I would give him 10 stars, if possible! MY experience with your Technical support was excellent Mr.K did a wonderful job.Very courteous individual thanks for the help. I called for 1 problem and didn't know that I had several other problems. Nitesh was very thorough in explaining every detail about what he was doing. I now have a better understanding of my computer and if I run into any problems I know how to get hold of Phone Support. My email problem ( unable to send due to server error '554 5.7.1' Relay access denied ) took a bit to fix by Nitesh. Nitesh ran several diagnostics on my PC, with my permission, and cleaned up a whole lot of unnecessary files, browsers, etc. I liked the upfront consultation approach to getting started. Vaibhav was very helpful with solving the problems I had with my computer. He took his time and made sure everything was running properly! Thank You! Everything was explained very thoroughly by the representative and he was also very pleasant. I am very happy with my purchase and with the excellent support I received! I could understand the conversation and the issue was reolved. My Phone Support was helpful to me in getting my computer cleaned and running more efficiently. I personally could not have completed this installation and cleanup on my own. Excellent results, friendly and knowledgable technician. I highly reccomend. I was very pleased with the service provided and the information shared with me by the technician. She was very knowledgeable and intelligent in the field of IT. The technician was very helpful.. My only concern was sometimes I could not understand him. The service I received was OUTSTANDING! My experience was excellent. Jeelani was excellent. He was knowledge and very professional. I began my call very frustrated with Microsoft. I feel that once I purchased a product I should not have to pay extra for making a simple error in the installation. I purchased the product and installed it with 4 hours of purchase. Because on my list of programs, Office 2016 did not show up, I uninstalled Office 365. I then tried to re-install Office 2016 and was told the key had already been used. Since Microsoft had a record of it being installed on my computer, you should have honored my purchase and let me re-install. Instead I spent 1 hour and 44 minutes and $200 to get it back on my computer. What a rip-off!!! However, once connected to My Phone Support (the $200 charge) I was treated politely and my issue was resolved to my satisfaction. I feel confident that any issue that I contact My Support for in the future will be handled efficiently. We were on the phone for four hours. During the later stages of our conversation, we had to connect with Spectrum support services and they sent an email with instructions. Only after that was the problem solved. I wonder why your tech support person did not do that in the first place? Good friendly service and complete explanation of what was wrong and how it was resolved. I was very happy with the help I got. The two gentlemen I talked to were very knowledgeable, clear and polite. The only reason I did not give five stars is because of the unexpected charge . Tech was very knowledgeable and patient. Nitesh was the tech and he was fabulous. Cleaned up my computer and fixed a hacker issue. Thank you! I had an issue with two unsuccessful attempts to reset my Microsoft password, and called for support. The MyPhone technician ran diagnostics and determined there were over 1000 tracking items that had slipped through Windows Defender and McAfee virus software. Technical support removed all the offending programs, cleared cookies, cache, old files, and installed TrackOff to prevent the issue from occurring again. They showed me how to determine where individuals were trying to hack in to my account (unsuccessful attempts in Phoenix and Tuscon). Nitesh was very helpful and did more than I expected. I am extremely pleased. very polite, step by step information as things progressed, constant reminders that Microsoft does not contact anyone by phone or spam. the tech was helpful with all my questions.